Dr Wyn Davies and Dr Prapa Kanagaratnam conducted St Mary's (London) first Laser Balloon treatment on Wednesday (12th October) using the CardioFocus system. They achieved 100% isolation on all four pulmonary veins over a period of 2hours 15minutes. Both Dr Davies and Dr Kanagaratnam were very pleased with the outcome. 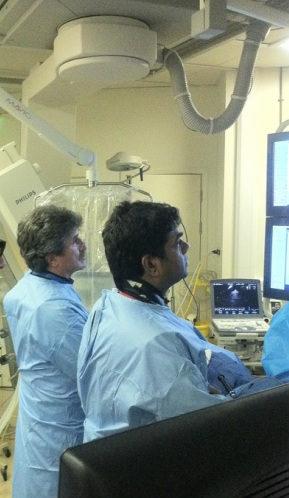 The CardioFocus laser balloon is the latest technique for ablating pulmonary veins in patients with Atrial Fibrillation. 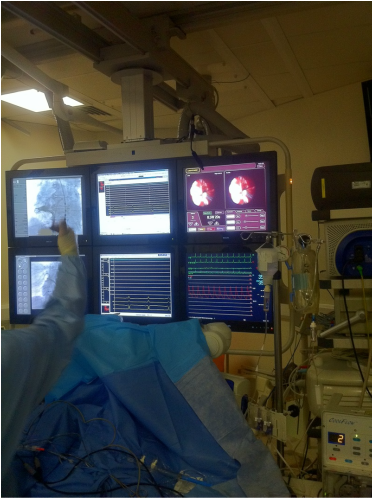 The CardioFocus system employs an Endoscope, so that the operators can clearly see where they are ablating, and a laser beam rather than the RF energy used in more traditional techniques. At no point with this new technique did the operators need to use complex navigation systems for catheter guidance.